Dame Margaret Natalie Smith, DBE CH (born 28 December 1934) is a British actress. She is better known as Maggie Smith. She made her stage debut in 1952 and is still performing after 60 years. She has won many awards for acting, both for the stage and for movies, including seven BAFTA Awards (five competitive awards and two special awards including the Bafta Fellowship in 1996), two Academy Awards, two Golden Globes, two Emmy Awards, a Laurence Olivier Award, two SAG Awards and a Tony Award. Her award winning movies include Othello (1965), The Prime of Miss Jean Brodie (1969), Travels with My Aunt (1972), California Suite (1978), Clash of the Titans (1981), A Room with a View (1985) and Gosford Park (2001). She has also been in a number of widely-popular movies, including Hook (1991), Sister Act (1992) and as Professor Minerva McGonagall in the Harry Potter movie series. She currently stars in the drama Downton Abbey as Violet Crawley, the Dowager Countess of Grantham, for which she has won an Emmy. Smith was born in Ilford, Essex. She moved to Oxford at age four and went to Oxford High School. Smith has been married twice. She married actor Robert Stephens on 29 June 1967 at Greenwich. The couple had two sons: actors Chris Larkin (born in 1967) and Toby Stephens (born in 1969). They divorced on 6 May 1974. She married playwright Beverley Cross on 23 August 1975 at Guildford. He died on 20 March 1998. In 2007, the Sunday Telegraph' reported that she had breast cancer. She has made a full recovery. 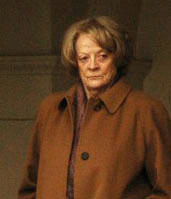 ↑ 1.0 1.1 Maggie Smith biography. Tiscali.film & TV. ↑ Maggie Smith. Film Reference.com. ↑ "Actress Maggie Smith recounts cancer battle". Google.com. 2009-10-05. Retrieved 2011-11-08. This page was last changed on 23 October 2018, at 10:47.